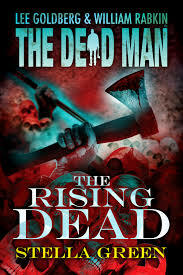 The Rising Dead by Stella Green concludes the second “season” of the Dead Man series. Written by a family friend of series producer Lee Goldberg, it’s one of the better books in the series. Goldberg was so impressed after reading the manuscript for Green’s first novel, Awakening Snakes, that he offered her a slot in the Dead Man series. In this episode Matt Cahill, with ax ever ready, first travels to Denver to check out a mountain climber who may be one of the resurrected too. A teenager has survived 18 days trapped in a crevice, was assumed dead when the rescuers could find no pulse, but later revived and claimed to see rotting corpses. Matt doesn’t quite make it to him in time, but does encounter several Russian mobsters. The actions shifts to the southwestern USA near the Mexican border where Matt encounters recently married couple Cheryl and Jeff who are on their way to San Bernardino, California. As usual, trouble comes looking for Matt when they give him a lift. After picking up a strange man walking along the lonesome highway, Matt begins to feel the evil influence of Mr. Dark.they drive into a gas station where a band of human smugglers, or coyotes just happen to be resting and the violence begins. The best part of the book is another resurrected character Green introduces to the series. Known only as “The Stranger” he’s a man who is hundreds of years old and has given up fighting the sinister demon of the series, Mr. Dark. He’s a standard character found in a hundred spaghetti western movies, but new to the Dead Man series. Much of the novelette is about him, including an entire episode where he last tried to wage war on the evil in Mexico. I’m hoping the series will bring back The Stranger. He’s proven to be the best character they’ve introduced.